Well, congratulations! You have a Garmin 910xt Forerunner, an incredibly powerful device with a tremendous number of functions, options, and features, all controlled – somehow – through seven buttons. I’ll assume that you are able to read a manual and follow directions, but in this article we’ll talk about some things that surprised or perplexed me in using the device, and maybe some of these may help you as well. 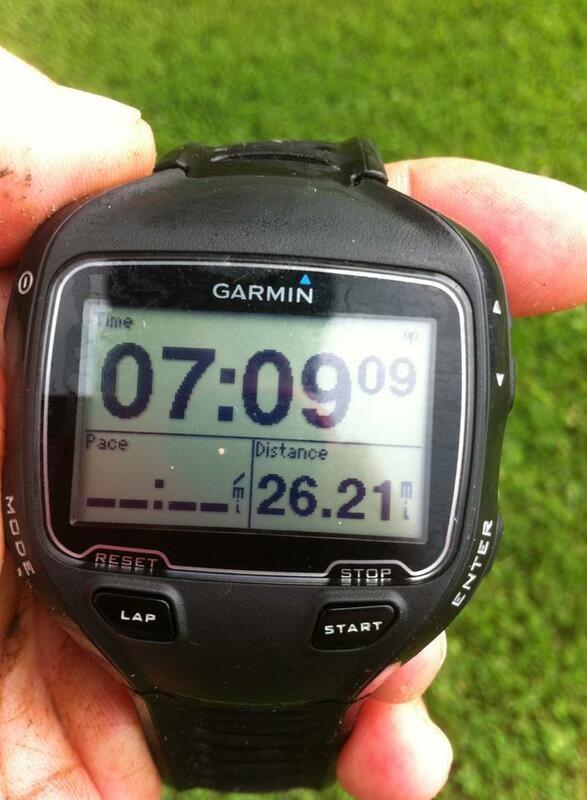 The day I hiked a trail marathon and my Garmin 910xt provided the evidence. This thing doesn’t have much in the way of a user’s manual. Go see the review by DCRainmaker.com. More than a review, he tells you everything you need to know about this device. It is the missing manual. But if I want to find the original user manual online, where is it? I think my Garmin is completely broken. None of my buttons are responding. This is most likely because you accidentally enabled the Button Lock feature by simultaneously pressing the “Mode” and “Scroll Up” buttons (which are located diagonally from each other). To unlock it, do the same button holding. Some people use this feature during the swim to keep from the buttons from accidentally getting hit when you are jostling during the swim. (Some others put the watch in their swim cap). If you lock the buttons, then obviously at the end of the swim you will need to unlock the buttons before you can press “Lap” to go on to the next leg. This thing seems to be completely locked up. This happens to me sometimes when transferring data. To turn your watch off when in this state (so it will restart correctly when you turn it back on), press and hold the power button for 20 seconds. Look at a clock when you do this, as 20 seconds is longer than you think. Somewhere during that time it should shut itself off and then you can turn it back on again. Why do I always seem to have to hit the “Enter” button twice before it does anything? Your button is working fine (so stop mashing it!) The first time you press the Enter button, it turns the backlight on in the display so you can read it if it’s dark out, and then the second press will do the “enter” function. If the light is already on (such as, if you have the display permanently lit or you just recently did something to make the display light up), the Enter button will do its thing immediately. This, of course, means that to read your watch in the dark, all you need to do is press “Enter” to turn on the backlight. If you want your light to be on permanently (which obviously drains the battery quicker), such as a night 5k or in a darkened spin class, go to “Settings” -> “System” -> “Display” -> “Backlight Timing” -> “Stays On”. You don’t need to waste a display window on time of day, in particular if all you want to know is what time it is before your race starts. If you press MODE until you get to the “main display” (the one that has “History”, “Training”, “GPS”, “Settings”), the local time is at the lower right hand corner (it’s really tiny). And how powerful is that “Mode” button, anyway? This is one of those “you’ll know what I’m talking about when it happens to you” things. I don’t think Garmin named this button very well. To me it sounds like it is the “All Powerful Master Override”. It should be more accurately be called “Display Mode”. It changes what type of pages are being displayed, specifically between the “managing the watch” pages and the “what am I doing right now” pages. The confusion comes about because if you are in the middle of an activity, you can still go back and forth to the “managing the watch” pages without stopping the activity. The other function of “Mode” is that it is the opposite of “Enter”: “Enter” steps into a function, “Mode” steps back out. So hitting “Mode” multiple times will get you back “home” when you’re lost. I can’t find the settings for swim (or bike or run). The 910xt obviously has a lot of functions and features, and sometimes finding the settings for all of them can be a challenge. Garmin puts them in two places, and sometimes you have to look in both. And they depend on what sport you currently have selected (i.e., you cannot set swim-specific settings if the current sport is running. That makes sense). Let’s say the current sport is “Run”. If you use MODE to go to the “main display” (the one that has “History”, “Training”, “GPS”, “Settings”), and select “Training’, you will see your selections for “Run Alerts”, “Workouts”, Courses”, “Virtual Racer”, etc. BUT there is another page of run-specific settings in another place: go back to that main page, this time select “Settings”, and you’ll see that there is a “Run Settings” display. Under there you will find “Data Fields”, “Autolap”, etc. Don’t forget to press and hold “Lap” for three seconds after your finish! This “closes” the activity so if you accidentally hit “Start”, it won’t resume the activity you just completed. Garmin refers to this function as “Reset” (it says so right next to the “Lap” button), which always scares me because it sounds like you are “throwing away what you just did”. But that’s not what it does, think of it as “save off the data of what I did and then reset everything to be ready for my next activity”. Or something like that. There are two different ways you can switch between sports relatively quickly. First of all, if you do the “Change Sport” from the “Training” page, you may notice that the “Change Sport” entry is at the bottom of the list, independent of what else is on the list (the list is different for swim/bike/run/other). When you call up the “Training” page, the top entry is highlighted. Because the list “rolls over” (it doesn’t stop at the top or bottom but rather keeps going), if you scroll UP by one position, you will be at the bottom of the menu, which is “Change Sport”. So you can get to “Change Sport” quickly by: “Training” (Enter) -> (Scroll up one) -> “Change Sport” (Enter). Secondly, there is a lesser known but even quicker way to get change sports. If you hold the “Mode” button for about 3 seconds, it goes straight to the “Change Sport” page. Either way you get there, what “Change Sport” does depends on whether or not you have an activity currently under way. If you have an activity still underway (which means you didn’t press “Lap” for three seconds to complete, or close, the activity), changing sports will manually create a multisport activity. So, for example, if you were doing a bike/run brick workout, you would press the “Start” button to pause the timer at the end of the bike leg, then when you are ready to start running, “Change Sport” to “Run”, and then push the “Start” to start the timer for running. In the history, the activity will show up as a “Multisport activity”, designated by a triangle icon instead of a swim, bike, or run icon. And then when complete, close the activity by pressing and holding “Lap” for three seconds. Where is that “Back to Start” function? This is particularly handy on out and back routes (the watch doesn’t have a built in map and router, so if you are riding/running a loop that you are 3/4 of the way through, it will take you back through that 3/4 of the loop to the start). I always find it hard to find the thing. It is NOT under “Training”. It is under “GPS”. Practice with Auto Multisport. Then, practice with Auto Multisport. This may be one of the features that attracted you to the 910xt: it will allow you to pre-program the segments of a multi sport race (triathlon, duathlon, biathlon, whatever) and when you press “Lap” between segments, it changes the displays and features appropriate to that leg, optionally including transitions (an dI have no idea why you wouldn’t want to record those, but whatever. Just check the “Include Transitions: box). – First after you set up the Multisport legs, “Start Auto Multisport” does not literally start the timer. It just means that the next time you hit the “Start” button, you will be entering the preprogrammed sequence. So feel free to set it up before your race and then do whatever you want, and just hit “Start” when you start. Practice. – Remember, you go from leg to leg by hitting the “Lap” button. So, a triathlon would be: “Start” when you start swimming, “Lap” when you get out of the water, “Lap” when you are at the mount dismount line and getting onto your bike, “lap” when you get off the bike, “Lap” when you leave out of T2, and “Lap” when you finish (it stops the timer because “Lap” completes the sequence). Practice. – AutoMultisport gives you an extra screen with useful information like total elapsed time, and a cute graphic telling you what you’re supposed to be doing right now (such as an arrow pointing at a little running figure, “go run now!”). So this will be an extra page to scroll through. One note about the total elapsed time – for a race over one hour, it’s not going to give you seconds. So if you are trying to carefully handcraft an IronMan 70.3 personal record after six and a half hours, you will have resolution only down to the nearest minute. Don’t laugh. I have done this. Oh, yeah, practice. – Unfortunately, if you press “Lap” too early, you can’t go back. The best thing to do then is to just do “Lap-Lap-Lap…”, and then manually change sports as described above. Not perfect, and you’ll probably have to use start/stop to pause for transitions, but you’ll have your displays (except for the extra “MultiSport” screen) and nearly all of your data. You will probably mess this up at least once during your transition practices, so you will have an opportunity to try this out beforehand. Practice. Remember to change your swim distance alert when you are go between an english unit vs metric pool. If you live in St. Louis, I can tell you exactly when you will come across this: you have been swimming in a 25 yard pool and have set your Swim Alert for 100 yards to help you keep track of your laps. Now you are at the St Peters Recplex Spring or Fall Triathlon and are getting ready to swim in the 50 meter pool. So, you dutifully set the pool length to 50 meters and figure the alert will now occur every 100 meters instead of 100 yards. Wrong! The watch assumes you still want to know every 100 yards, and the Swim Alert (which you didn’t look at) now says “91 meters”, and you are going to be getting alerts at what seem like odd times. So, you will probabaly want to go to Swim Alerts and change that to “100 meters”. You get to have different display options for pool and open water swims. You probably want different displays for your pool swimming (like time, rate per 100 yards, distance in yards) than for open water (I just have time, and distance in miles). And, in fact, the defaults are different. The Garmin 910xt is smart enough to treat the display settings for open water vs pool swimming differently, so you can set up different displays for the two and it will keep it straight. You don’t really have to do anything, it is just a nice feature. Just say no to the Quick Release option. The Garmin Quick Release kit allows you to move the watch from your wrist to a mount on the bike and then back to your wrist. A friend of mine lost his watch during his first Ironman, possibly from his wrist hitting a neoprene clad fellow racer he was in close quarters with (I should point out that Garmin replaced the watch). I saw mine on the bottom of a pool when my arm hit a lane divider. My opinion is that it doesn’t seem worth the risk. There are some workarounds (such as, use the quick release but put the watch itself in your swim cap), but I have never tried these. I have gone back to using the regular wrist band and put a bike computer on my bike. Now I get cadence, speed and distance on my bike computer, and heart rate and bike time on my wrist (I don’t own a power meter). 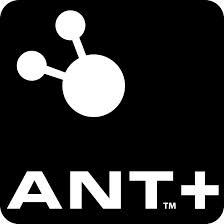 ANT+ is the method by which the Garmin 910xt communicates with peripherals and other devices: your heart rate monitor, foot pod, power meter, speed and cadence sensor, your computer, etc. It also can connect to properly equipped sports equipment such as stationary bicycles and treadmills. In order to make this work, you need to find a device with the logo shown here. On the Watch, you need to go tp “Settings” -> “System” -> “Fitness Equipment” and enable fitness equipment; you will see a little icon in the upper right. Then you hold the watch in the vicinity of the logo on the fitness equipment. Seems straightforward so why do I have this here? Well, for me, the syncing works sporadically. Sometimes I need to disable/enable the function, and sometimes power the watch off and on. Eventually it will work. Just give yourself plenty of time before that Spin class! Also, you can’t “pre sync” for an indoor triathlon, because when you leave with your watch togo swim, it loses sync with the device because, well, you’re gone and it needs to be available for someone else. You don’t need to know this but it is so geeky cool. I learned this when I was troubleshooting on the phone with a Garmin support tech. You can get to the Garmin 910xt diagnostic screens in the following way: (1) Turn off your watch. (2) Press and hold the “Enter” button. (3) While holding the “Enter” button, press and hold the “Power” button. The watch will now show the first diagnostic screen. Release the buttons. Now, go to the eighth diagnostic screen by pressing “Mode” 7 times. At the bottom you will see “Accel X”, “Accel Y”, and “Accel Z”. These are the outputs of the three accelerometers that are used in swimming to detect your pool edge turns, your strokes, and identifying the type of stroke. When you are holding the watch, it is telling you which direction it is sensing gravity (purists, just go with me here). The unit’s are “g’s”, where one g is the force of gravity (purists, really stop it now) at the Earth’s surface. So you can rotate your watch, and when you get one of the numbers to be about “1” and the other two to be about “0”, then one of the accelerometers is pointing straight down. How cool is that? The best words ever: “Auto Multisport Complete”! This entry was posted in Technology by Bill Sanders. Bookmark the permalink. This is very helpful information-thanks! Just splurged on a 910xt b/c my 310 stopped talking to my computer last October and I’ve gone as long as I could stand without having my training and event data in one place. Headed to Nautica Malibu Tri in September with CNN FitNation team! Thanks again. So sorry that I missed your comment until now! Hope your training is going well, that the Garmin is working out for you, and best wishes at the Nautica Malibu Tri. Make sure you have fun! I am a fairly new runner and recently discovered “workouts”. I set it for four 9 minute intervals at different paces and it has recorded the workout as an activity, the two times I used it. Today, I tried to use the workout mode for my run but, when I finished, it hadn’t recorded the activity. It lead me through the workout, telling me slow down or speed up to keep the pace I entered and kept the 9 minutes timed for each interval. I tried to simulate a workout multiple times today to see if maybe I hit a wrong button, but I have not been able to record the activity when I use it in “workout” mode. Do you know why? I have heard of similar things happen to others (it obviously know an event is going on , the timer is running, but in the end it hasn’t stored the activity), but not involving Workout specifically. One question: when you do a Workout, it stops by itself at the end (i.e., you don’t have to hit the “start/stop” button). But are you still remembering to press and hold the “lap/reset” button until it does it’s 3-2-1 countdown? That is still necessary to store the event, even when using the Workout feature. I have two questions about my 910XT. 1) is there a way to have races recorded as multisport activities appear on Garmin Connect and/or Strava as a single event with 5 laps? This is how it appears in the watch History. But when I upload Race data to Garmin Connect and Strava it appears as 5 separate activities, and I loose my overall time. Before Garmin Express, at least Strava would represent races as one event with an overall time, and 1 lap for each Tri leg and transition. 2) In my last two races, the HR display is — for about 10 minutes, then comes to life. I have a new HR strap, and have no other HR trouble (as I’ve heard others mention). – As far as I know, Garmin Connect doesn’t have a way to stitch the individual legs of a multisport activity back together. It certainly is frustrating, considering that the 910xt itself is well aware that this was a multisport activity. Garmin’s server side support certainly seems to lag their hardware products. I find it amazing that Garmin’s iPhone app still calls swim events “other”. I would think the watch has been out long enough for this to have been address. BTW I use the excellent third party iPhone app ConnectStats instead. Garmin should buy this guy’s product and hire him. – I haven’t heard of that particular mode before. I’m guessing it hasn’t always done that. If you haven’t, you might want to consider changing the battery. You are supposed to get a battery low level indication I believe, but you never know. I’m sure by now you’ve noticed that Garmin Connect now groups together the legs of a multisport race. It was certainly about time! I did my first 70.3 in Cozumel and the forerunner recorded a very low HR during the bike leg and did not display and record the pace during the run. I was using the multisport mode and I had similar trouble with the HR during training using multisport mode. I thought that it was the band so I was using a new one. Have you heard about this problem with the forerunner while being use in multisport mode. any comments or welcome. I’m sorry I missed seeing your comment. I’m not certain that I’ve heard of that problem, although I know I was having problems with the heart rate monitor this past summer. Ultimately, I replaced the monitor and that corrected it (meaning, the electronic part, not the band). That seemed very odd since there shouldn’t be anything in the monitor to wear out, other than the battery, and I had already replaced that! Did your heart rate and pace work normally when it was not in multisport mode? Great article. I have a question, I would think a fairly common one at that. I did a bike run, bike brick today and forgot to switch from bike to run. I did however, stop and reset the watch after the bike and started a new recording for the run I just didn’t change the sport. I was hoping there was away to change the sport after the fact and have all the data changed to what it would have been for a run not the bike. I am so sorry for the late reply on this (eight months!!!). For some reason I haven’t been getting the notifications – and it’s not like I get a lot of comments so I don’t check all that often. When you tell the 910xt what type of activity you are doing, that is also telling it what sensors to look for, and how to forma the data. For example, it won’t record from a running footpad if you are cycling, or take data from a cadence sensor if you are running. Similarly, it is going to internal store the data as speed for cycling and pace for running (by default, you can change those in the settings). Although there are ways that one could say, change pace to speed and vice versa if you really wanted to, there wouldn’t be any way to recover data that wasn’t recorded. I am trying to use my Garmin 910 in the pool but it will not detect my distance. What am I doing wrong? I am in swim mode. I’ve selected pool swimming, pool size (25 yards) and I’ve set-up distance as one of my data fields. I press “start”. I start to swim. It calculates the elapsed time but it does not calculate my distance. Do I have a problem with my Garmin OR am I doing something wrong? I use my Garmin as a watch BUT I’ve turn the Garmin off completely f and then, back on when I am ready to use for swim and I still have the problem. Please let me know if you think it is user error or Garmin error. And if user error, what could I be doing incorrectly. Thank you! I am sorry for the delayed reply, I haven’t been getting notifications. I am guessing you have long since gotten this resolved. On the face of it, it doesn’t sound like you are doing anything wrong. It would appear that the accelerometers in the watch are not detecting the change in motion when you make the turn at the end of the pool. It is possible, but unlikely, that your turns are so subtle that they are not being detected. You can find that out by trying it again and making a really strong push away from the wall. If that’s not the case, then I would go straight to Garmin support. Thanks so much for posting item 8. I am struggling with my 910xt when lap swimming and was concerned that the accelerometer was not working and this cool tech tip solidified that the accelerometer is indeed working. Now on to troubleshooting more why I can’t use the watch for lap swimming. Mind you, I love the watch and it is excellent for running, cycling, and open water swimming. Not the end of the world, however would be nice to see the stroke type when ows and make it easier for lap swimming. Sorry for the late reply. I take it you are talking about #18 (the accelerometer diagnostics) and not the #8? Sounds like the accelerometers are working but somehow not getting recorded by the software. Definitely time to do #3, contact Garmin support! I have heard some club members mention the elevation issues, where it starts reading 60,000 feet. I followed the instructions on a few blogs cleaning the two holes by the screw on the back three times before it started working correctly again. The third time I soaked it for thirty minutes in hot soapy water (Dawn Detergent) and scrubbed it with a toothbrush. Then I let the watch sit overnight to dry. Works great again. Thanks, Scott! That comes up so often that I may add that as “#20”. I had that problem with mine quite some time ago – when the problem was “new” – and back then they were replacing those units. If someone has one that is still under warranty, they probably should call Garmin support before they try this! Here is one way I know of that you can do it, if you have an iPhone. This gadget costs about $60 USD and plugs into the port on an iPhone (if you have an iPhone 5 or later, you will also need an adapter cable because Apple’s port changed). Used in conjunction with the Wahoo Fitness app, it allows you to offload your runs and send them up to Garmin Connect. And it has other uses, it allows the iPhone to communicate with any ANT+ sensors. I have a garmin 910 xt and for some reason it has stopped recording all activities after 17th of November. I run everyday and after the 17thof Nov it showed all the runs that were in progress but has not stored them so cannot see any data. I was careful to hold down the reset button for storing the data after each run. The data simply vanishes. What can do to fix this? I’m curious, have you been syncing your watch with your computer so your activities are uploading to Garmin Connect? After that they can be erased. I’m wondering if you are running out of memory on the 910xt. We wait an update to unable the date and time on the screen. If you are a user of forerunner 305xt remember that is a standard display on the screen If you unable it. That would be a nice feature to have. The 920xt does something like that. On the 910t, there is a time of day (but I don’t believe date) field that you can add, but I know that’s not really what you’re looking for. Unfortunately, since the 910t is now an “older” device, I’m guessing that Garmin probably won’t be adding much in the way of new features to it. Was wondering if you could help me. Sometimes when i am in run or swim mode and i stop the timer with the start/stop button it restarts its self. It picks up back where it left off (most of the time) last week i swam 1800 yds and hit the stop button to rest and it restarted. then it came back without the history. any help would be appreciated!!! thank you! Sorry, Jason, I got delayed there. If I had to make a guess (and it’s nothing more than that), it would sound like maybe the start/stop button itself is going bad. This would definitely one you would want to contact Garmin Support about. By the way, did you know that when you are swimming, the way Garmin expects you to use the watch is that you only hit start/stop at the beginning of your workout and at the end, and in between, you use the lap button when you get to the wall, say, at the end of a 100 yard if you are doing sets of 100’s. The watch is smart enough to recognize the difference between a rest interval and a swimming interval. Hope you are still here and paying attention!? THIS IS THE GREATEST POST EVER!!! SO HELPFUL! My problem is that my swims will not upload to Garmin Training Center. My other activities (running and biking) do upload. But my unit does record the swims w no problems. I can find them under “HISTORY”. HELP!? Thanks for the kind comment! Obviously I’m not real active with he blog – something about life and triathlon getting int he way – but I do see that this posting still draws a lot of interest. Quick answer from me is: wow, that is weird! The combination of it being able to upload the other activity types AND that you can see the swims in the history, that is very strange. Switching over to using those might help out (and, by the way, they are a lot nicer, after a somewhat rocky start). Hello… I have a 910XT and once in a while it doesn’t do a sync correctly, and the watch decides to shutdown mid-sync. When I reset the watch, it then wants to download EVERY activity on the watch, even those already downloaded. It can take download time from 1-2 mins to 30 mins sometimes, depending on when I last cleaned it up. Thoughts? Ummh, I see this is over 6 months old, I’m guessing you have probably moved on, sorry. I’m stretching my head because it seems to me I remember seeing the same thing a long time ago (or it may have been with my Edge 500 bike computer). Honestly, I can’t remember how what I did and I’m guessing it resolved itself eventually through a software update. You’ve already noted that it helps to clean off the activities. It seems to me that, indeed, whenever these gadgets get confused on the syncing, they want to go ahead and download everything again from the watch, it’s probably some sort of failsafe mechanism, be better than having activities on the watch that you can’t get too – that would be even MORE frustrating! My Garmin 910xt turns off whenever I open my history. I have tried a master reset several times but would not fix. Do you have any idea what could be the cause of the problem? Did you know you can activate the backlight without pressing any buttons by tapping the screen twice? I’ve noticed that too, but Garmin seems to be a little unsure as to whether that’s intentional or “it just does that”! My last 910 did that, but I bought another used one and it doesn’t. Maybe that’s why Garmin is unsure if it’s a feature. That would be a great function but, as best I can tell, none of the Garmin devices let you set fractional units for the denominator. It’s possible that the newer devices like 920xt and later may have a Connect IQ app (specifically a Data Field) that might do that. I didn’t see one during a quick look in the Connect IQ Store, but obviously that would’t help with the 910xt anyway. Sorry. Many thanks, Bill. Cheers, Charles A. The Garmin 910 xt not show steps nor cadence, my questions is that is necessary have the footpod? And when I offload the data at Garmin connect, it would show that information according on the store said me. But it is not like this. Or how to set the watch to get steps and cadence. Yes, the 910xt does require a footpad to record running cadence. You may be able to find others that are less expensive. It will need to be ANT+ compatible. I do not believe the 910xt shows total steps for an activity, this is more associated with watches that you wear all day (like a 920 xt), versus the 910xt that you wear just for the exercise activity. It might show up in Garmin Connect under “Steps”, but not for the activity. I have not tried this with the 910xt so I am not certain. With the 910xt, you will need to calibrate your footpad if you want to be able to read distance from it, for example if you are running indoors or on a treadmill. The calibration instructions are in the Owner’s manual (in the English version, it’s on Page 25). I used the “Calibrating Your Foot Pod by Distance” option. Question – Does Lithium man have any insight on the life of a Garmin Ant Stick? Seems like mine are dying at the rate of once a year. I leave it plugged into my Macbook all the time. Are you supposed to unplug them? I am minimizing the opportunity to lose it by leaving it plugged in. I can’t say that I’ve heard of that, but I never left mine pugged in for long periods of time, either.